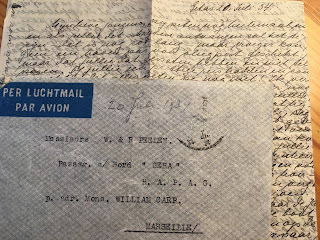 Family lore tells us that she liked to go to concerts and opera at the Concertgebouw in Amsterdam, taking her two sons with her and leaving a note for her husband. Before writing this post, I thought I didn't have much more more information about her, but in the family archive I have found copies of cuttings of advertisements in the local Zaandijk paper which show that she taught handcrafts, sewing and pattern cutting. The first ad, placed in 1873, announces that Miss J. C. Bronke intends to offer a course in handcraft for girls, commencing in August and it will cover both the useful and tasteful - nut en van smaak. The second ad, dated 1878, announces that Miss J.C. Bronke now has available all the sewing patterns and pattern book for perusal and that she will offer a course in pattern cutting in November. No address is given, so it must have been generally known how to get hold of her. She would have been 26 years old at this time. She married Jan Blomberg on 23rd May 1881 in Zaandijk and they took up residence at Marnixkade 39, Amsterdam from the day they were married. Jan Blomberg was a principal of a primary school. Their first son, Johannes Blomberg was born there on 8 March 1882, and then a daughter, Cornelia, born on 14 June 1884, who only lived to the age of six. Childhood mortality was very high in the Netherlands, throughout the 19th century and I can see this clearly in my family tree too. Cor Bronke had herself lost an older sister, Maartje, who was only eight years old, and now she's lost her daughter - their darling, as it says in the death notice. I'm guessing it must have been some childhood illness, a fever perhaps, but I haven't found the record to back that up. A year later they welcomed their son Cornelis, my grandfather, on 31st August, 1885. Both sons went on to develop careers in pharmacy, becoming Apothekers. 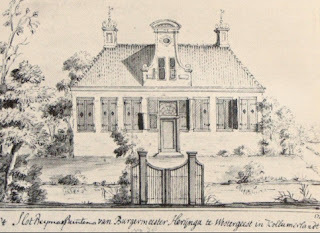 The family story goes that father Jan Blomberg financed his eldest son's studies, but required Johannes to finance his younger brother's studies. Which apparently he did. I mentioned before that grandfather Cornelis (Kees) Blomberg was a supporter of the women's emancipation movement and I think his mother had a lot to do with that. Looking at that tiny portrait again, I get the impression that she was no "shrinking violet". 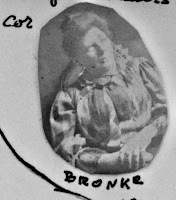 Cor Blomberg-Bronke passed away on 9 December 1919 in Amsterdam.